Datacenter Luxembourg, the independent data center service provider and Calligo, the Microsoft Azure Stack specialists, partner to host Calligo’s Microsoft Azure Stack infrastructure environment. Calligo was founded with the aim of enhancing cloud computing, and the company has built data protection into every aspect of its operations. The European Union’s forthcoming General Data Protection Regulation (GDPR) represents a seismic shift in data protection. To allay clients’ growing concerns over where their data resides in a cloud environment, Calligo decided to launch Microsoft Azure Stack hybrid cloud services hosted in its own jurisdictions. To host the solution in Luxembourg, Calligo joined forces with Datacenter Luxembourg, who has proven experience in hosting internet facing platforms. – Jean-Philippe Entemeyer, Managing Director Calligo (Luxembourg) S.A.
Jean-Philippe Entemeyer explained that their new Azure Stack solution came racked and ready to go. “The highly flexible team within Datacenter Luxembourg gave us the opportunity to host the solution within one month”. He continued: “As a result of the new partnership with Datacenter Luxembourg, we are one of the few companies able to provide Microsoft Azure Stack in Luxembourg.” If you wish to deploy your own cloud hosting solution, contact us to find out more. On May 9th, 2018, Calligo is launching its IT, GDPR and data privacy services into Luxembourg at the Golf Club Grand-Ducal in Senningerberg, and in particular the availability of Microsoft Azure Stack. Bart Roels, Partner Technology Strategist at Microsoft, is joining to present on Microsoft Azure Stack, including its technical benefits and how it supports data privacy. 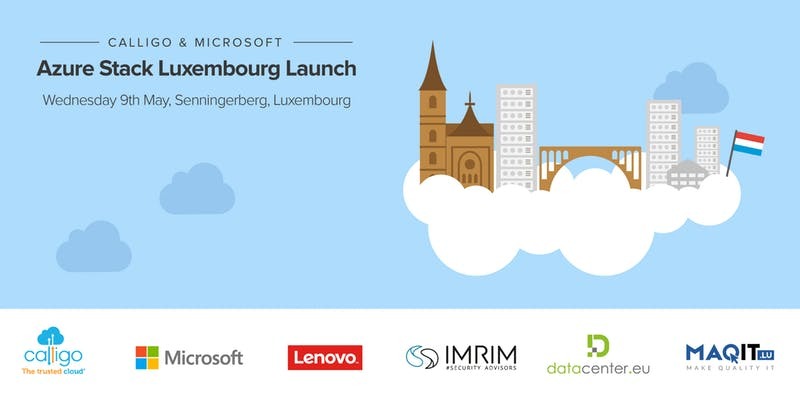 Datacenter Luxembourg will be present at this event to answer all your questions about hosting the Calligo Azure Stack environment. If you are interested to attend this event as our partner, please sign up here. Founded in 2011, Calligo provides trusted, privacy-conscious cloud solutions to businesses across the globe. Calligo’s emphasis on GDPR services and data residency enables clients to leverage the advantages of combining innovative cloud technologies, unrivalled expertise and a commitment to the highest level of standards based compliance and privacy. In September 2017, Calligo acquired AMS Systems PSF S.A.. AMS now trades as Calligo (Luxembourg) SA.